Continuing in the tradition of Ludmilla Petrushevskaya’s dark fairytales, the jaded yet occasionally hopeful romanticism of Miranda July, and the magical realism of Karen Russell and Ramona Ausubel, newcomer Kelly Luce crafts narratives that are as fantastical as they are emotively true in her debut story collection, Three Scenarios in Which Hana Sasaki Grows A Tail. Luce possesses a rare gift for creating worlds where readers are challenged to view the strange as ordinary and the ordinary as curious. The world of Hana Sasaki is one inhabited by the ghosts of lost little boys with cameras who visit fountains where wishes are cast with coins tossed by the living (“Wishes”). Her stories paint portraits of men and women whose capacity for love can be calculated by machines (“Amormeter”) and where for “one night only, for sale at cost, everything you’ve ever lost” can be found including your own heart (“Reunion”). Luce’s collection of stories embodies the complexities of intimacy, desire, and belonging. Each protagonist’s encounter with absence, loss, and love reflects the universal experience of being and human connectedness. Delicately coupling Japanese lore and American pop culture alongside the anxiety of postmodernity’s wake, Luce’s prose is refreshingly sincere, witty, and imaginative. “The Blue Demon of Ikumi” is a simultaneous retelling of an ancient legend of a beautiful woman who came from the sea and the portrait of a man and his lover. It is at its core nostalgic, yet fails to be merely sentimental. Luce’s expansion of legends and cultivation of new myths prove her prowess as a storyteller. This is most evident in “Wisher,” “The Blue Demon of Ikumi,” “Reunion,” and “Ms. Yamada’s Toaster,” each story revitalizing the ancient with the new. 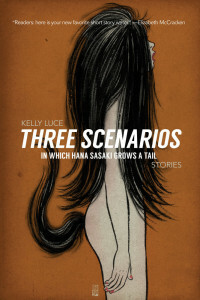 The collection’s namesake “Three Scenarios in Which Hana Sasaki Grows a Tail” does the same in episodic vignettes depicting the protagonist’s changes from child to woman, from human to something else. Illustrating the span of years of this experience within a few pages, Luce’s choice to present the narrative in the form of vignettes showcases the power brevity can render within the narrative arch in juxtaposition to the psychological implications of physical change and one’s identity. In a world where school girls disappear in karaoke parlors and where ashes fall from the sky like snow, weird occurrences are formative, its what makes us who we are. Readers familiar with speculative fiction will find that Luce’s collection extends the genre’s boundaries into narrative realms that linger in the mind well after the page is turned. Dianca London Potts is an MFA student at the New School for Fiction. Her words have been featured in APIARY Magazine, New Wave Vomit, and The Big Takeover. Kelly Luce‘s story “Rooey” was originally published in TLR’s Spring 2010 issue, How To Read Music. “Rooey” is also available to read instantly from TLR Online by going here.